I’m calling this my Jem and The Holograms mani! The bright pink crème is OPI Kiss Me I’m Brazilian, such a POP of color. Nice formula, normally I can get away with 2 coats for this one but when my nails are longer I need 3 because my nail line is very dark. This shimmery purple is Butter London Stroppy, 2 coats for opaqueness. It has fuchsia sparklies in it! Gorgeous color, if you like purple I HIGHLY recommend this one. 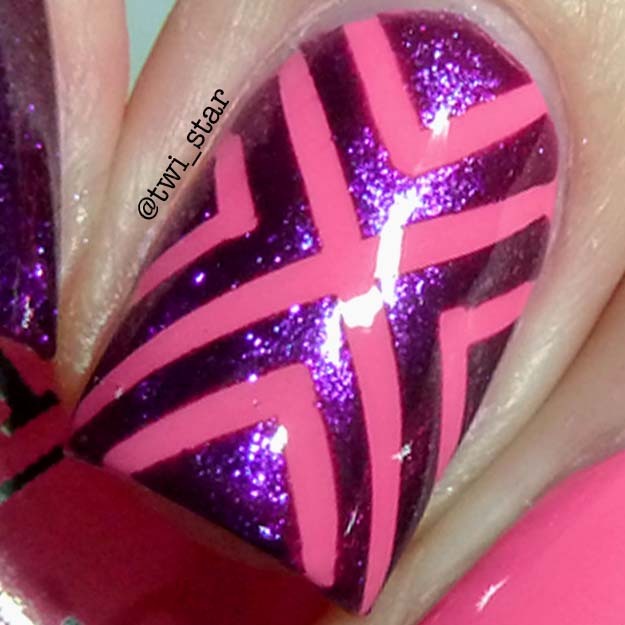 For the accent nail I used striping tape to make the X pattern and added purple 2 mm nail studs that I got from ebay.